Purchase "Apocalypse of the Dead"
Apocalypse of the Dead is killer. This is an epic tale of human survival in the zombies-are-everywhere-and-I-need-a-freaking-gun tradition. 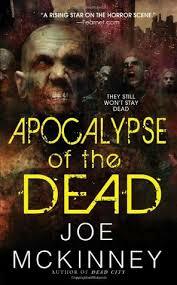 Faced with countless undead, the book's four major storylines follow the survivors of a zombie plague. As the stories interweave, they create a terrifying tapestry of mayhem, weaponry, and gore. When a bite or a scratch can make a friend instantly turn into a drooling, clawing, and hungry zombie, it's a dangerous world indeed. The story begins two years after the events in McKinney's Dead City. Houston has been walled off with its borders enforced by the Gulf Region Quarantine Authority. Trapped within are countless Infected, along with a handful of non-infected humans struggling to stay alive in a world that has written them off as collateral damage. What they want most is to escape. And escape, they do... accidently taking the undead filovirus with them. Uncontrolled and unstoppable, the virus spreads around the world and society collapses. The survivors are left to fend for themselves. Needless to say, most are unprepared for such an event. A blind woman, an escaped convict, Florida retirees, a preacher and his flock, a police sharpshooter, a motorcycle gang, and two guys with hookers and an RV, all find themselves living moment-to-moment, fighting for their lives. To make matters worse, not all of the survivors are nice people, and some will do anything to prevail. Anything. As the stories converge, the survivors are faced with the question of whether it's possible to re-form society in a zombified world. The survivors are embattled and the undead aren't going away anytime soon. To make matters worse, to survive in this new world, one might have to accept the fact that the strong rule, and the weak serve. McKinney has created his best work to date and it’s a must-read. Reminiscent of The Stand, (not a comparison to be taken lightly), this book starts with a bang and never slows down. The characters come alive (even if only for a little while) and among the twists and turns there are more than a few surprises. Apocalypse of the Dead goes beyond the traditional bash-them-in-the-head-with-a-baseball-bat storyline and offers a few philosophical head-scratchers as well. Not to say that there's not a sufficient supply of rotting flesh, oozing brains, bullets, and leaking body fluids. Yum. Read this book, if you can. If not, watch out for the headshot that puts you out of your misery. (c) 2015 by R. B. Payne. All Rights Reserved.